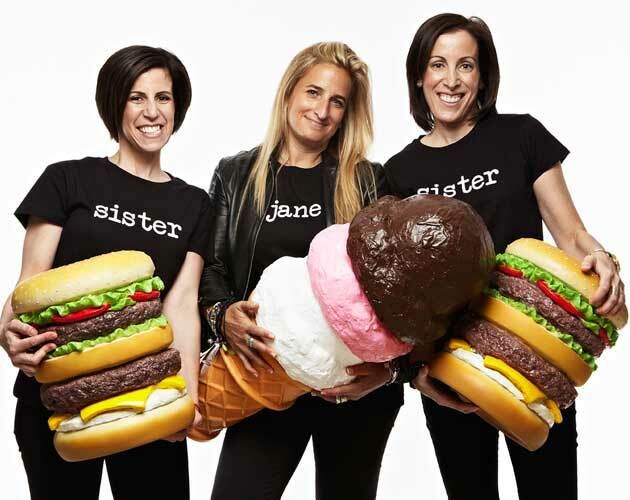 They’re two sisters and a Jane (Julie Albert, Lisa Gnat and Jane Apor, to be more specific), and they’re bringing their fun recipes to everythingzoomer.com starting this month. Julie and Lisa are the ladies behind the successful Bite Me cookbook, and turned their venture into a trio with the addition of Jane for their followup, Bite Me Too. The recipe books are filled with playful dishes with a quirky twist. The ladies are also big proponents of easy entertaining and turning everyday events into celebrations with clever craft ideas and dollar store finds. We caught up with Julie to get the scoop on Bite Me More. EZ: Bite Me More sounds like such an in-your-face name. How did you decide to use this provocative moniker? Julie Albert: Bite Me More is a cheeky name with an innocent start. It was our call to action, our way to get people “biting” when we wrote our two cookbooks, Bite Me and Bite Me Too. Our books not only hold the answer to “What’s for dinner?” but they also provide a fun and playful approach to eating, feeding and entertaining. While we’ve had great success with the cookbooks, we wanted to give so much “more” and provide a complete road map for easy, chic and affordable living. EZ: Explain your concept of everyday entertaining. Somehow, I think this is a little different than Martha Stewart’s approach. Julie Albert: While we admire the Glue Gun Goddess, we live in a world where we don’t have the time or inclination to whip up 10-hour broths or hand-stitched tablecloths every time we want to have friends and family over. We’re all about bringing fun, style and laughs to the kitchen and table without breaking our backs or the bank. Our recipes are easy to follow, calling for items from the local grocery store (sorry, no guava paste here) and our decor ideas are all about turning hay into gold. EZ: Your recipes are fun and lighthearted, but some serious foodies may balk at this approach. Julie Albert: Our approach might be fun and lighthearted, but our recipes deliver seriously great taste and across-the-buffet rave reviews. While we love to eat out and get inspired by trendy foodies, our goal is to provide realistic, attainable and delicious recipes that serve up solutions for real people. And hey, if there’s a foodie out there who can’t enjoy a scrumptious piece of our Rice Krispie French Toast Souffle … more for the rest of us! EZ: Do you have any tips or advice for novices when it comes to entertaining? Julie Albert: I am the poster child for someone who feared company coming and whose cooking repertoire consisted of noodles and butter – that is, until we wrote our cookbooks. Easy entertaining isn’t an oxymoron. To stretch your dollar, our in-house chef Lisa suggests cooking in large batches, taking advantage of your freezer (less waste and a lower price per portion) and sticking to your shopping list to avoid impulse buys. For decor, we serve up creative theme parties using finds from dollar stores and craft stores – cool, stylish and affordable inspiration without too much perspiration! Forget fresh flowers (we have other easy non-perishable centrepiece ideas) and, of course, look around the house. Your cupboards might house exactly what you’re looking for (Scrabble board for games night!) to bring a playful energy to the party. Stay tuned to everythingzoomer.com for daily delicious recipes and entertaining ideas from Bite Me More.